At Mission San Luis, visitors can experience a unique way to learn about Florida’s history by exploring a reconstructed village and speaking with living history interpreters dressed in period costumes. Mission San Luis, located in Tallahassee, Florida, was the western capital of Spanish Florida from 1656 to 1704. At the mission, native Apalachee Indians and Spaniards lived together until they were threatened by English forces and had to evacuate. A National Historic Landmark since 1960, Mission San Luis has been reconstructed so visitors can go back in time to experience what it was like to live in this 17th-century community. On the mission’s 63 acres, visitors can explore an Apalachee council house, a typical Spanish residential area, a blacksmith shop, a military complex, and the mission church. The Mission San Luis visitor center is quite impressive itself. As we entered the lobby, the front door and lobby ceiling quickly grabbed our attention because of the beautiful detailing. Inside there is also a 125-seat theater, where visitors can watch a short video about the history of the mission, and a small exhibit gallery. Don’t let the size fool you, however. There are a lot of really interesting Apalachee and Spanish artifacts. Remember to open the drawers to find more cool items! The real fun starts outside though. The first thing that catches your eye is the council house. It’s huge!! It is five stories high, 125 feet in diameter, and could hold between 2,000 and 3,000 people. Inside we saw where the chief sat, typical native items, and learned about the different political and ceremonial activities that took place there. Continuing along, we stopped by the Spanish village. We entered a reconstructed house built of wattle and daub and spoke to a woman who was in the process of drying out some herbs from her garden. Once she showed us around the house, she took us outside and showed us the chicken coop and told us more about her daily routine. We then visited the blacksmith. He was making nails for the fort. We watched as he heated and pounded the metal and then cooled it off in water. It was a really interesting process to watch. Next we walked over to El Castillo de San Luis, the military complex where Spanish soldiers lived and trained. Here we learned about the weapons that were used by soldiers of that time and also what a typical day entailed. Our final stop was the mission church, where both Spaniards and Apalachees attended mass. The building is constructed of wooden planks, has a thatch roof, and measures 50 by 110 feet. – Mission San Luis is the only Spanish colonial mission in Florida that has been reconstructed and is open to the public. – The council house is the largest known historic period Indian building in the Southeast. – Although the mission existed for only 48 years, its importance to Spanish colonization efforts in Florida were second only to St. Augustine. – The residents of Mission San Luis evacuated the site only two days before English forces arrived on July 31, 1704. Being able to walk around the grounds of Mission San Luis and see what it was like to live here centuries ago was a really cool experience. The living history interpreters all really knew their history and answered all of the questions that we had. The combination of having them tell their stories as well as seeing the reconstructed buildings was a great and unique way to learn more about the early history of Northern Florida. Very cool! I couldn’t believe how big the council house was. I also love when they do live demonstrations at the blacksmith shop. It gives you a real feel for what life was like back then. 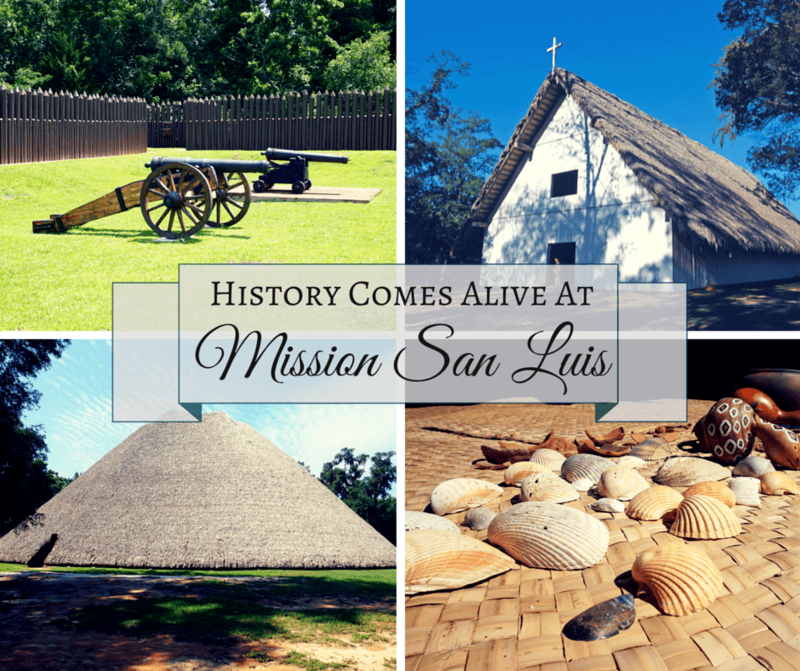 Will be adding Mission San Luis to our bucket list! I know, the size was incredible! Seeing things like that in person really gives you a greater respect for the lifestyle they had back then. Glad you enjoyed the post Bryanna! I’ve visited many missions over the years but all on the left coast! The Spanish were prolific in their zeal to convert and build all along the waterways weren’t they? Yes they were Elaine. It’s interesting to see how they progressed across the US. Been enjoying reading all your posts about the different missions! Thanks for sharing them. Thanks for a very informative post. I love the carvings on the door and am amazed at the huge council house. It is awesome that the native Americans and the Spanish colonizers lived together amicably. I agree Nisha, you don’t hear of that happening too often. The design of the council house is really interesting. They certainly built on a huge scale, the carved church door is a beautiful example. I’ve been to several missions in California, but Mission San Luis looks quite different! It’s cool that they had people there to reenact what went on and explain things. The Council House looks amazing! I have visited several missions in California. I didn’t realize they had one in Florida as well. I like how they have reenactments! Makes it easier to visualize how life was like back then. Yes, the Spanish had many settlements in Florida so it’s really cool to visit one that really let’s you see what it was like to live in the area back then.